Black rat snakes are carnivorous reptiles native to eastern parts of North America. Although these snakes are skillful hunters of small animals, they pose little risk to humans as they do not produce venom. Black rat snakes conserve energy in the winter by hibernating, but one of the more interesting black rat snake facts is that they often share hibernation dens with other species of snake such as copperheads. The length of a fully-grown black rat snake ranges from 3.5 feet to 8 feet, although most measure between 3 and 5 feet in length. 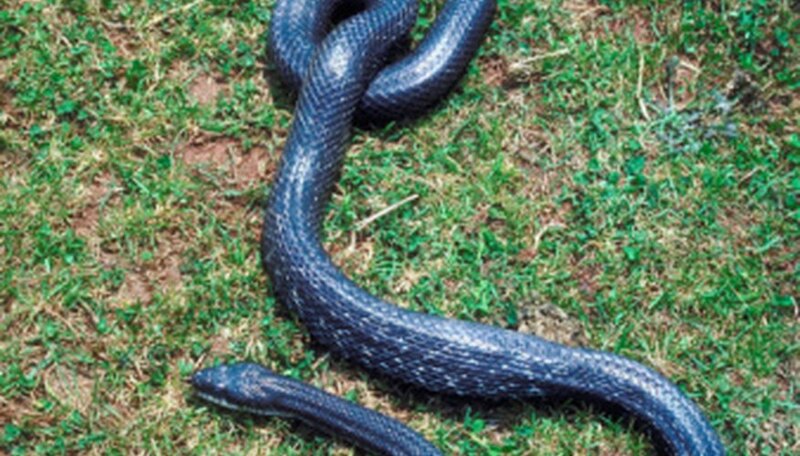 Adult snakes are mostly black and have a glossy appearance. Adults have a white throat and belly. Baby black snakes aren't actually black, but instead mostly gray with large, brown, irregular-shaped spots. Juvenile black rat snakes darken as they mature and develop their black coloration as they approach their adult size. Occasionally, traces of a snake’s juvenile markings are still visible on an adult snake. Black rat snakes usually inhabit marsh, woodland, or forest regions with rocky areas and a supply of water. The black rat snake’s range includes eastern and southeastern areas of the United States. The black rat snake’s diet is made up of small mammals, rodents, small birds, bird eggs and lizards. Black rat snakes stalk their prey by hiding in holes in trees or man-made structures. They are also excellent climbers, capable of climbing trees easily to catch their prey. 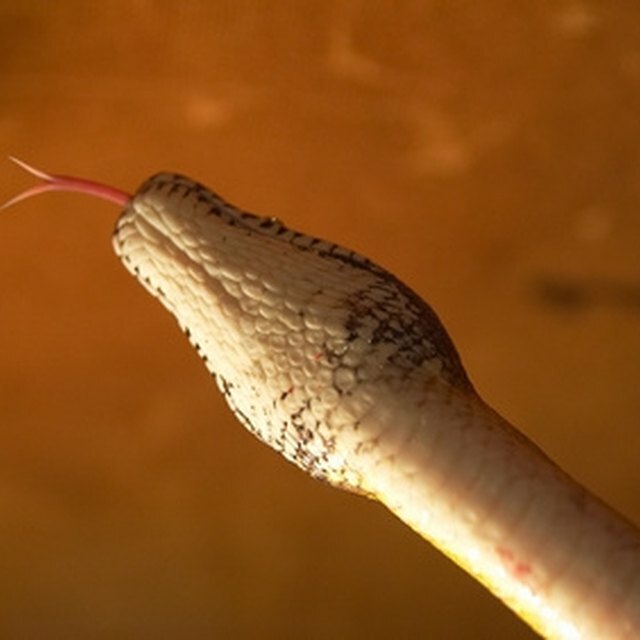 This snake kills its prey by wrapping its body around it and constricting, or suffocating, it. Black rat snakes hunt during the day during spring and fall but hunt at night in the summer to avoid the strong heat of the sun. Although humans are the adult black rat snake’s main predators, young snakes are exposed to the threat of other predators such as bobcats, raccoons and hawks. Black rat snakes are non-poisonous and are not usually aggressive, preferring to stay still and quiet to avoid predators. However, they may bite, hiss or produce musk if they feel extremely threatened, particularly if they are picked up. A black rat snake also defends itself by vibrating its tail, which can fool a predator into thinking it is a rattlesnake. After black rat snakes mate in the spring, the female lays between five and 30 eggs in early summer. The female usually lays her eggs in a pile of rotting vegetation or manure or in a rotting log. After a period of around 60 days, baby black snakes measuring around 12 inches in length hatch from the eggs. Ames, Hayley. "Facts on Black Rat Snakes." Sciencing, https://sciencing.com/black-rat-snakes-8685188.html. 17 September 2018.